Ella Pearl Kirk enjoyed her visit from the Cheyenne President’s Leadership Council members last week. 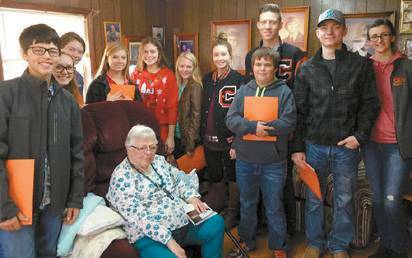 Pictured around Ella Pearl are Justyce Boyett, Sarah Haven, Sarah Atha, Jasmine Boyett, Hadley Smith, Jolie Baker, Amber Smith, Hagen Fallwell, Nathan Jackson, Aaron Broadwater and Leah Sander. Thank You: Little Town – Big Christmas!